I started reading this book because I needed a break from the many fantasy books I have been reading and reviewing. I am so glad I decided to give this one a try- it was fabulous! Justine is almost an anti-hero. She can be rude, crass, and has very low self-esteem. She is pretty much how I viewed myself as a teenager (not that that was who I was, but it was who I saw myself as). Teens will find her relatable and easy to understand as a character. Although she is in an odd situation in front of cameras, Justine still deals with problems that all teens do-finding friends, feeling lonely, fitting in, liking yourself. I am a self-proclaimed hater of reality tv- especially reality tv that has children. I occasionally find myself hooked to a show, but for the most part find myself simply tolerating them. I wasn't sure how that part of the storyline would fly with me, but I have to say- it felt new and unexpected in the best way possible. I loved how the teens related to each other and how everything seemed to revolve around this movie. I can't really go into the relationships within the book; I feel like that would be revealing too much. The character relationships are what drive this book. The author is at her best when writing characters and their relationships and feelings. 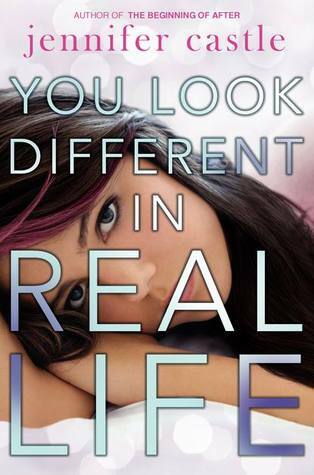 You Look Different in Real Life is smart, funny, heartbreaking, and unlike any book I have read before. I am so glad I picked it up and I will absolutely recommend it to fans of contemporary reads and people looking for something different. I've been eyeing this book as well (also as a break from all the fantasy/paranormal I read). I will definitely check it out soon! I hate reality tv but I love reading about it for some reason-Justine kind of annoyed me but at least the other characters provided their amusements.